It's a good feeling to work with like-minded players, getting better at what we do, working on a cohesive sound. The latest line-up joining me in the band are three talented and genuinely nice guys. Wes Skakun on drums has been with me for a couple of years now. Marq DeSouza has been a friend and colleague for several years, but only recently joined the band, first playing bass before switching over to second guitar and vocals. The latest add is Jean Savoie on bass and vocals. Besides playing bass, he's also been the manager of the bass dept. at Long and McQuade for 14 years. Like I say, it's a good group to hang with. Our first show is at the Libra Room on Commercial Dr. on Dec. 29th. Followed the next night in Port Coquitlam, then New Year's Eve at Carnegie Centre at Main and Hastings. Details are posted on the "shows" page. I hope you'll catch us in action. Sarnia Boys latest release is here. Add it to the growing list of anti-Trump songs. Political songs are alive and well. Every movement needs anthems and we're putting this one forward. David Puzak is my fellow Sarnia Boy and this is our fourth release. Download and stream at CD Baby and at BandCamp. Added bonus at Bandcamp, check out another SB creation, "NoNon". I'm not Bruno Mars. Or Bruce Springsteen. With the exception of certain gigs (coffee houses, house concerts, some festivals) the audiences I play for don't want to hear a night of originals. 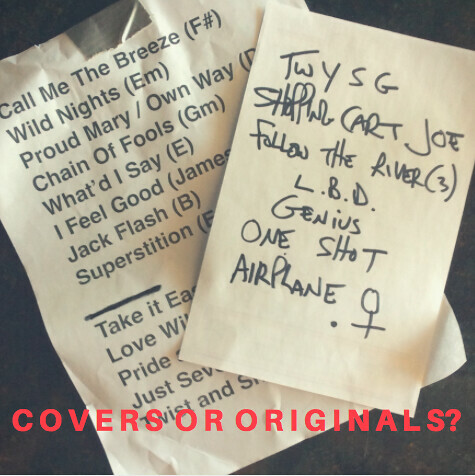 Bar gigs call for a healthy mix of familiar tunes with some originals sprinkled in there surreptiously. That's the only way to keep the customers (and the bookers) satisfied and coming back for more. I like playing popular covers but not ALL the time and not to the exclusion of my own music. I've got four albums released, a few EPs, several singles and videos. I've invested my money, time, and talent in writing and capturing these songs. I get radio play, worldwide for my original music and that never gets old. I'm proud of the songwriting talent I've been given and have nurtured and developed over the years. So I'm being more selective, choosing gigs where there's a listening audience who will appreciate my original songs. That keeps the element of 'fun' in the mix. There will always be exceptions - I'm not being precious about it. New Year's Eve is one example. We're booked to play at Carnegie Centre and I know they'll want to dance and hear songs they know. Another example is a band gig this weekend. 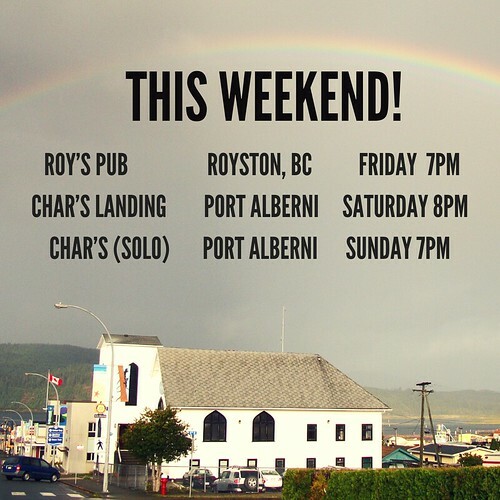 We're playing our third "Rock n' Roll Dance Party" at Char's Landing in Port Alberni. Sure, I'll throw in a handful of originals, but mostly the goal is to keep the dance floor occupied and the way to do that is with familiar, uptempo favorites. The next night though, I'll be doing a second gig at Char's. This time sharing the bill with Port Alberni songwriter, Chase Spencer. I'll be playing solo, all originals, to a listening audience. But even if I could only do these type of gigs I'd miss the dancing fun. So go figure. It's a balancing act I guess. It's show day. Got a gig at The Arms Pub out in the 'burbs tonight. Band gig. Getting my gear sorted out, trying new settings, checking cords. Very satisfying for some reason. Similar to doing basic html coding. One litle key stroke can alter the whole look. 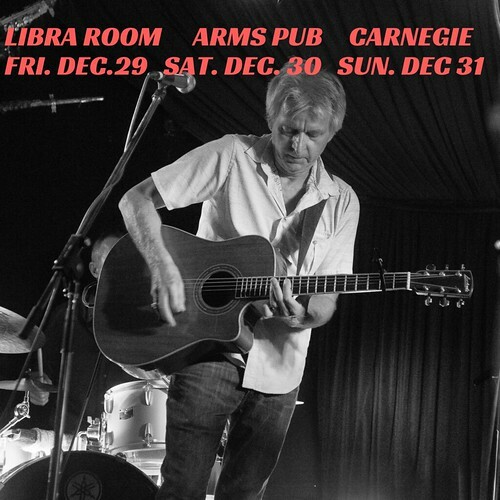 We'll be back there on Saturday Dec. 30th and then we're playing the next night - New Year's Eve - at Carnegie Centre. This is an alcohol-free venue right in the heart of the Downtown Eastside. Hastings and Main. I've played there several times in recent years, and it's always a good experience. Lots of stories, lots of heart down there. Plus the stage, P.A. (with soundman), and lighting are all top grade. Playing solo/acoustic next Friday at a church in Lynn Valley. These gigs where the audience is there to listen are my favorite. I get to do my quieter, story songs. Details for the above shows, and more, are on my "shows" page. Good article posted here about Trees Coffee House's Music Nights. I booked and hosted there for eleven years, as most of you know. In June I passed it on to Marq DeSouza and it carries on in good hands. Marq also is playing bass and singing back up in my current band line-up. And he's also an excellent singer/songwriter and multi-instrumentalist. Life is good, feeling like everything's in balance. There's some band changes. Peg Wilson (bass) and Brice Tabish (guitar/vocals) are solidly booked on weekends with Las Divas, so I've had to recruit some new players. I debuted a new line up last weekend at the Re-Opening of The Libra Room. Mike Dewey on second guitar and vocals, Marq DeSouza on bass. And Wes Skakun (drums) has been with me for the last year so he knows the tunes. For a new band, it went really well. Thirty five songs, covers and originals with no train wrecks. My former bandmate, Beaver T. (guitar/vocals) is coming back to town for a week of shows in early November. I'll join him for a few shows, working with his rhythm section. Plus he'll join me at The Libra Room on Thursday Nov. 1st. See my "shows" page for details. Any of you who have seen Beaver T. know what a phenomenal player he is. There's another short tour coming up on Vancouver Island in November plus a few solo/acoustic shows. I expect there'll be more shows with Peg and Brice too, when we can find a date(s) that work for us. Change can be a good thing. I've been taking some time off this summer to enjoy family time and recharge my creative batteries. 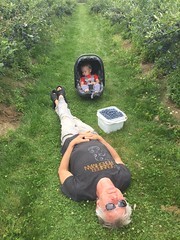 Here I am with my grandson picking blueberries. A couple of gigs here and there, some co-writing sessions, and a bit of recording, but mostly finding ways to enjoy the summer. Coming up in September is a four-date tour on Vancouver Island. Two solo gigs and two band gigs. Details on my "shows" page. We recorded an R&B original, "Save Me" for a five-song video and audio project. Really happy to see it continuing to get radio play. The latest airplay is on DJ Brant Zwicker's one-hour syndicated blues show "At The Crossroads". The track was recorded and produced by Brice Tabish. "At The Crossroads" is heard in New Orleans on WXDR; St. Louis, Missouri on the Radio Arts Foundation at 107.3FM; Angelica, New York on WRAQ FM; and St. Leo, Florida on WLSL FM. In Canada you can hear the show on 24 stations in BC, Alberta, New Brunswick, Yukon, and North West Territories. Also a dozen or so internet radio stations in Europe and North America. And you can hear "Save Me" on my music page and see a live video recording on my YouTube channel. Click on the links on the right. I've got three new live video recordings on Youtube. Recorded by George Faulkner. Here's one of the three, "My First Mistake" a dystopian folk blues, that is particularly relevant in this Trumpian Age we are living in. Check out the others on my Youtube channel! It's been awhile since I've updated the "News" Page so I thought I should check in. I was in Portugal for three weeks, on holiday, from mid May to early June. A week in Lisbon, then took the train up to Porto, spent a few days there, then went inland, along the Douro River, again by train. This is wine country, terraced hillsides, lots of olive trees. really scenic. The last week we were in the Algarve, the southern most region with white sand beaches that go on for miles. Lots of history here too of course. It was a very relaxing and interesting time. I highly recommend Portugal. I played a duo gig this morning at the Roundhouse Community Centre. This gig, being on a Saturday morning always involves a young audience. Everything from Twinkle Twinkle to Twist and Shout. It's a great way to start a weekend, shaking your sillies out. On Tuesday, I'll be shooting a couple of videos of solo songs, just for fun, and something to show to bookers. Rehearsing midweek with the band for a Friday gig. And as always, I'll have one ear open for any new song ideas that come my way. After eleven years of booking and hosting the Friday Music Nights at Trees Organic Coffee House, I've decided to retire. Marq DeSouza is taking over the business. To mark the end of an era, I'll be playing there on the last Friday of this month. Some musical friends who were there with me at the beginning will be joining me. Hope you'll join us. "We Don't Need No Dance Floor" -- co-written by John Pippus, Mario Vaira, and Rachel Suter -- has been chosen as a TOP 10 finalist in a Canada-wide songwriting contest in the "live video performance" category . The Canadian Songwriting Competition (CSC) is sponsored by SOCAN, Canadian Musician Magazine, Royal Bank of Canada, The Noize Faktory, and others. SCROLL DOWN, and "like" your favourite video - which I hope will be Live Performance FINALIST #6! The video for "We Don't Need No Dance Floor" was shot and edited by Weird Geometry's Andrew Del Monte. The audio was recorded and mixed by Brice Tabish. The John Pippus Band is playing three dates on Vancouver Island in early May. Looking forward to seeing our Island friends again, and making new friends too. Getting out of town is always a blast. First up, at The Copper Owl on Thursday May 4th. Opening for one of my all-time favourite bluesmen, Bill Johnson and his blues band. Advance tickets here. The next night, Friday May 5th we'll be at Roy's Towne Pub in Royston. It's close enough to Brice Tabish's hometown of Campbell River that we're expecting quite a contingent to show up there. It's a pub gig. No cover, just good times. More details on this night, and the others, on my "Shows" page. We wrap up the tour with a bang in Port Alberni at Char's Landing on Saturday May 6th. I've played here several times over the years, but always as a solo singer/songwriter. This time is different. It's going to be a full-on rock and roll dance party. Here's the Facebook Event with the details. Char's Landing is well known on the Canadian music circuit. It's a 100-year old converted church with amazing acoustics. I've had so many magical performances there. I'm really looking forward to bringing my band this time, rolling up the rug, and kicking it with our classic rock and R&B repertoire. Port Alberni's Jenna Audrey is going to join us on some tunes as well. By the way, that photo? It's not that unusual to see our bass player, Peg Wilson, in that position. After all, she was one of the coaches for the Women's Olympic Team some years ago. "Weapons Of Emotion" is the latest EP. You can stream and download at the usual sites: Spotify, iTunes, CD Baby, Amazon, Google Play. Also at Bandcamp where you can order the CD as well as stream and download. We'll be playing all-original songs at the upcoming show at The Fairview Pub. See "Shows" page for details. Pay-what-you-can. Singer/songwriter Yaa-Hemaa plays an opening set at 8:30PM. The Fairview has an excellent stage, sound system, dance floor. Come celebrate the First Day of Spring! Here's a video that Yaa-Hemaa made. A moving tribute to foreign domestic workers. It's here! "Weapons Of Emotion" is the name of my latest video album. Recorded at Pandora's Box Studio with Brice Tabish (guitar), Peg Wilson (bass), and Wes Skakun (drums). Video by Andrew Del Monte at www.weirdgeometry.com. Brice recorded and mixed the sound. Look (and listen) on my Youtube Channel. I'm really proud of what we all accomplished here. Please SHARE far and wide! I'm getting ready to release a five-song EP (see post below). And I want to have it get noticed on Spotify. I'm giving myself a crash course in this streaming platform. It's where all the cool kids are. Downloading and - heheh - CDs are fading in the rear view mirror. Thanks! And now that you're following me on Spotify, you'll be the first to know when the as-yet-untitled EP is ready for streaming.